How do you handle your new principal’s demands? Is the managing director refusing to budge? Dr Sue Pember, the former head of FE and skills investment at the Department for Business, Innovation and Skills (BIS), who was awarded an OBE for services to the sector in 2000, puts her extensive sector knowledge to good use in a new section for FE Week. In Dr Sue’s first section, she answers some of the questions she gets asked most often. Email DrSue@feweek.co.uk to ask her your question. I am a sabbatical officer and therefore am not a student or elected representative. This means that I often feel very out of touch with my students and fear they find me difficult to talk to and do not see me as a peer. 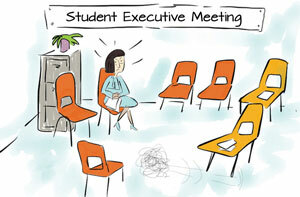 I do try to hold regular Student Executive Meetings but attendance is often poor and students are far from enthusiastic and proactive. Although I put on workshops and the like as part of the Youth and Wellbeing Team these are rarely well received and students are blasé at best. This makes it incredibly difficult for me too truly grasp the wants and needs of my students. Is there something I can do to improve this or are these simply the trials that should be expected when trying to represent FE students? Please don’t lose faith or get demotivated. Seeing that you attended the NUS conference and are now writing to me shows you are very committed. And yes, it is difficult and you are not alone in being unsure about whether you are making an impact. Your first step is to talk to your principal, head of student experience and clerk, and explain that you want be proactive but you need their help. Ask about whether they feel the student voice is strong enough? You might find they are worried too. Go with a set of suggestions about what you would like to do, such as monthly surgeries, and ask if they could advertise them. Say you would like to join the programme course reviews so that you can pick up on student issues, and start a “you said it and we acted upon it” initiative. You also need to see what’s happening elsewhere. Go on visits to other colleges to pick up on best practice and bring those ideas back. Talk to NUS and look at their development materials. Get other governors on side by taking a paper to the board about strengthening the student voice. And, of course, make the best use you can of social media. It can take a newly-appointed governor (fresh to FE and corporate governance) at least two years to get their feet under the corporation table, so to speak. Over the following six years they accumulate considerable knowledge and governance experience, at a cost to the college for training events, conferences, and as well as their own time. Knowledge associated with the running of the college — with all the complexities of the various funding streams, multi-site campus operations, curriculum and associated delivery quality management. Then, just when they consider that they are making a really worthwhile contribution their (two by four years) eight years are up and they are off the Board and “redundant”. Current personal experience suggests that colleges are not too keen to take on experienced governors and some still operate a representative agenda. Perhaps this attitude needs further research and maybe a “re-cycling scheme” introduced for experienced governors who still wish to support this exciting sector? You raise a very interesting question which is being widely discussed at the moment. There is a move to limit the time governors spend at a single college, mainly because there is perceived wisdom that the longer a person stays the less likely they are to challenge and scrutinise the way a college operates. I agree with you that research needs to be done in this area. It is felt that new governors will bring new ideas and challenge established assumptions and long held views. It is thought that some of the problems of governance seen in recent years exist because everyone is too comfortable and cosy. New governors, if well selected, could bring in new ideas and fresh perspectives but, they need a good induction and support to get them up to speed quickly. The role of a search committee is to get a balance of experience and knowledge, which provides challenge and fresh new ways of thinking and working. I see some scope for your concept of recycling although I wouldn’t like it be called that. Experience and challenge is much needed in the sector. I recently heard of several governors who, having done their two terms in one college, have moved on to another college to support that college’s development. Often these governors have been able to go in as the chair because they have exactly the skills needed to match college needs.